The Magellan eXplorist 600 satellite navigation system features a 3-axis electronic compass, a barometric pressure altimeter, barometer, and thermometer, plus the ability to expand your GPS mapping via a high-speed USB data port and unlimited secure digital (SD) card storage. The Magellan Geocache Manager enables you to download caches directly to your Magellan eXplorist 600 and with the PC-style file memory system it's easy to manage all of your data. Accessories, spares and parts are still available for your eXplorist 600, as are TOPO maps. The Magellan eXplorist 600 features a 16-colour display so you can see everything in brilliant colour. Four navigation screens; View speed, direction, distance to destination and all the GPS information you need on 4 easy-to-read colour navigation screens. The Magellan eXplorist 600 is pocket-sized, powerful and full of valuable features, 8 MB of built-in maps and 8 MB of additional memory means you can save up to 5 track log files, 20 routes and 500 points of interest on the internal memory, but you can store as many as you want on optional SD cards. Magellan TrueFixT technology provides superior accuracy and reliability giving you the freedom to explore without concern of getting lost. The Magellan eXplorist 600s' built-in electronic 3-axis compass points you in the right direction even when you are standing still or upside down on a rocky peak. Like carrying your own little weather station with Barometer, Thermometer, Barometric Pressure Altimeter to keep track of your elevation no matter how high your adventure takes you. The 16-color screen of the Magellan eXplorist 600 makes reading maps and GPS information easy with vibrant graphics in all lighting conditions. Want to find the distance between three or more points of interest that you plan to hike around or the area between them? Simply select the points of interest on the map and the eXplorist can determine the area between them and the perimeter around them. Download geocache coordinates from Internet sites and use them on your outdoor adventures. This unique feature makes managing coordinates even easier with a PC-style file system. You don't have to be a geocacher to appreciate the Magellan Geocache Manager. The Magellan eXplorist 600 global positioning system is ready to go with no service fees and no activation fees. This Magellan handheld navigation system features one-button access takes you directly to all of the most important features. Intuitive operation with keypad and joystick control adds even more fun to GPS navigation. Do you have a question about the Magellan eXplorist 600 or other handheld GPS related question that's not been answered on this webpage? Please see our handheld and Outdoor GPS FAQs page for questions from other customers.Plus if the answer to your question isn't featured, use the online form to ask us for the answer. Alternatively please telephone 01733 777623 Monday to Friday (9:30am-5:00pm) to speak to one of our sales team. The Magellan eXplorist 600 cigarette lighter adaptor provides easy installation in a car. Clip Case - eXplorist Keep your Magellan eXplorist GPS secure and right where you need it. Bike Mounting Bracket - eXplorist Conveniently mount your Magellan eXplorist series GPS receiver on your bicycle or motorcycle. Swivel Mounting Bracket - eXplorist Conveniently mount your Magellan eXplorist series GPS receiver in your car, truck, boat or virtually any vehicle. Vehicle Mounting Bracket - eXplorist Strong suction cups conveniently secure your Magellan eXplorist series GPS receiver to the windshield of your car. The Magellan eXplorist 600 is installed with maps of Europe. MapSend DirectRoute Europe can be purchased separately. This software adds advanced, automated street guidance to your Magellan GPS handheld satnav device including turn-by-turn directions, visual and audio prompts, easy rerouting, detailed street-level road maps and extensive Points of Interest. Looking for accessories and spares for the Magellan eXplorist 600? Many parts are available including a clip case, cigarette lighter adaptor and vehicle mount. 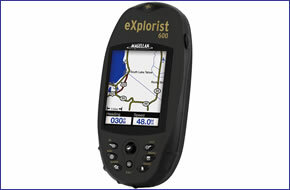 Add TOPO maps of Great Britain to the Magellan eXplorist 600. Available regions include TOO The Midlands and TOPO Southern England. Or alternatively add TOPO maps of France to your eXplorist XL including TOPO The French Alps and TOPO French Pyrenees.